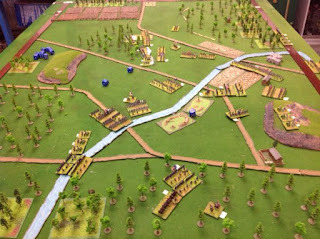 This is the third scenario of our three game 1863 mini campaign. Game wise both the Confederates and Federals have won a game so this is the clincher. The Epic Points situation is a different matter with 6 between first and forth. I foresee a lot of Epic 'actions' coming up in this last game! As a twist though after the battle players will get dealt the usual six Campaign Cards required after a regular 1863 campaign game with the only card of interest being the 'Name In The Papers' one which of course allocates Epic Points to the recipient(s) and that could easily change the final Epic Point standings. Again we ran through the mini 'Post Game Process'. Units recovered their stragglers which were half their losses, all active units rolled to see if their Elan dropped and a Hero roll was carried out for each engaged regiment. The Leader’s traits/abilities again didn't change. Each player’s base values were then tallied up and additional 'historical' units added to keep them around the total point value of 210. I used “historically” available units and now the whole of the Union Vth Corps is engaged and the Rebels have received fresh men from Rhode's Division as a top up as the other units of Ewell’s IInd Corps converge on the area. 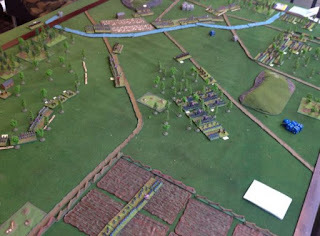 The action at Round Top Ridge had seen the Southern forces of General Early defeated and they retired south westwards rapidly reforming on the banks of Codorus Creek. There early halted his men and form a defensive line as he was buoyed in his hopes of holding the Yankees and men from Rhode’s Division would be able to reinforce him before nightfall. Federal General Sykes was confident after beating the Confederates and he pursued the Rebels closely as his regiments were relatively fresh and his overall numbers were strengthened by the arrival of the balance of the Corps 2nd Division. He believed he could deal a crushing blow to Early’s Division while they were in retreat and isolated, he was unaware that more Rebels were nearby. As soon as the Southerners stopped as Codorus Creek he deployed all his available troops for an attack. There was still several hours of good light and he considered hitting the Confederate forces again before they could rest and be reinforced and while his own men were flushed with success was the best course of action. Forces are balanced at approximately 210 points per command. Scenario special rules and objectives are in place. The Union Vth Corps commanders, Ayres and Crawford were quick to assess the Rebels position at Codorus Creek even though it looked formidable with a river and forest covering their frontage they were certain they could attack it successfully. The Federals focused their line of advance on the Rebels river positions leaving only two regiments and a battery to cover their left. 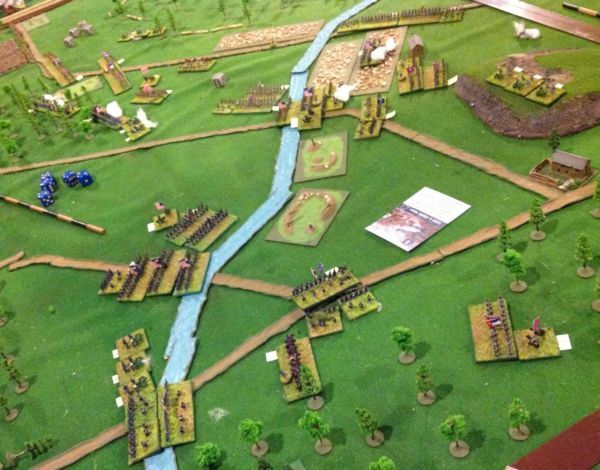 The Yankees took casualties as they advanced the lead units of Ayres Brigade were dispersed completely. Quickly the men in blue were at the river bank duelling with the Rebels and the musketry favoured them. Losses on both sides rose steadily! As the first Union troops crossed the river in two locations the Rebels started to reinforce their left and emerging from the thick forest. The Rebels of Avery's Brigade on the far left of the Confederate position were broken by the flood of Crawford’s Yankees that were crossing the Codorus while Ayres troops were not only halted at the other crossing but suffered great casualties. At this point of the battle just as Brigadier General Gordons North Carolinians were about to envelope the central Union regiments the Confederate leaders decided their losses were too great to continue the action and ordered their commands to withdrawal! The Union forces of Vth Corps had scored a great success! Pete 2 Epic Points, lost 11 bases, Epic Points running total is 15 Campaign Winner! 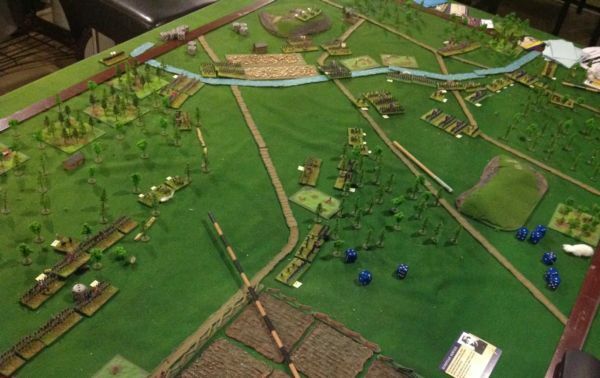 The game begins, the CSA is to the right of picture, the river scenario is closest and the forest line one is futherest. 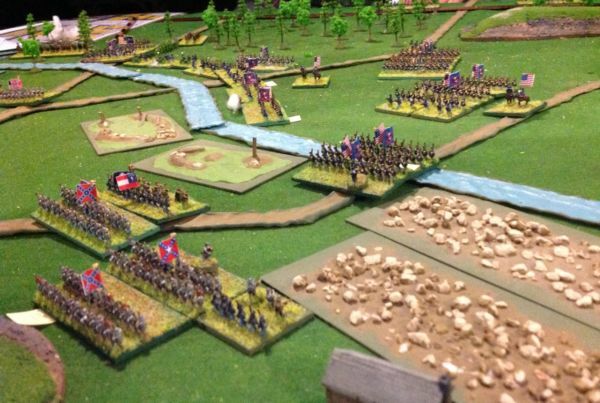 The Union Corps can already be seen moving from units from its left flank to the centre. The CSA artillery fires with little effect! 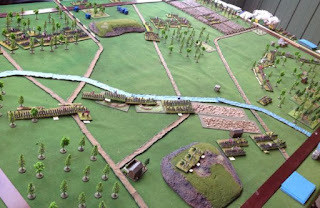 The Union attack continues to develop, CSA infantry have already advanced from the tree line to try to interdict the Union move toward Codorus Creek. 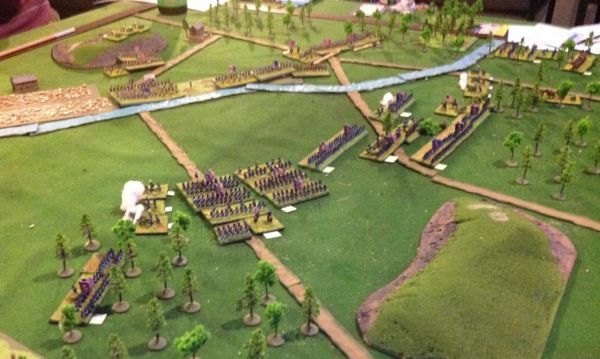 After destroying the Union Cavalry in the centre the Rebels return to the tree line as the Yankee artillery deploys, in front of Codorus Creek the Union right moves forward. The Rebel artillery is still proving rather ineffective expecialy on their right where the Bad Fuses card is played! 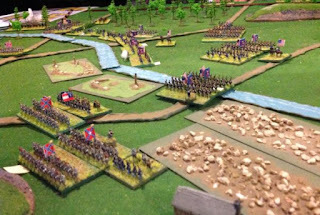 The massed Union attack unfolds on Codorus Creek, the Yankees are stalled by the 'the couldn't hit an elephant' and 'confusion' cards but the Rebels are slow to redeploy their right (me!). Two abortive charge turns slow the movement of reserves! A Rebel Yell charge by the right flank fails and does no more than stop the other troops moving to aid their comrades. 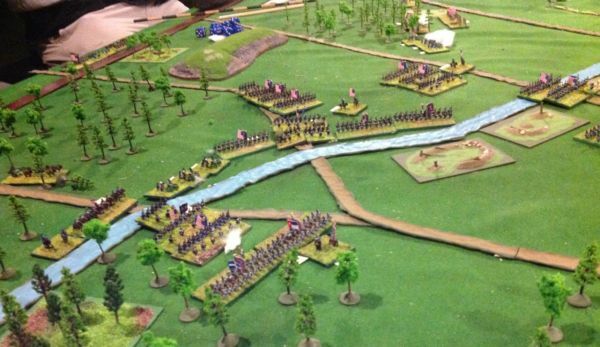 The first Union troops can be seen crossing the Creek this turn. Clever placement of poor terrain on the Rebel side of the Creek during the deployment is hampering their defensive fire! The abortive Rebel Yell charge! Three bases out of six make contact and are roundly beaten! 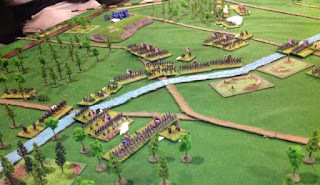 The Union army is cross the Creek! 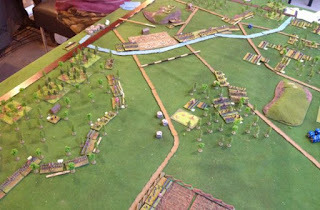 A couple of turns later and the Union own the banks of Codorus Creek! On the right of this pricture the first Yankees engage the entrenched Rebs and on the right a second Federal regiment crosses the Creek in the centre to replace one already destroyed by the desparte defenders. At this point even though attacking the Union losses are exactly the same as the defenders, the Yankees are firing like men possessed! The unit positions near the end of the penultimate turn, both sides are finally fully engaged. Top left you can see the Rebel right has finally locked horns with the Union men. In the centre toward the top you can also see just behind the Yankee regiment across the Creek a regiment of North Carolinans is about to come into play! Only a few bases are required to break either side at the end of the turn so everything is depending on who gets the initiative for turn 12! Turn 12 and the Federals get the initiative, they destroy several Rebel bases and roll a SIX on a D6 to secure the victory! 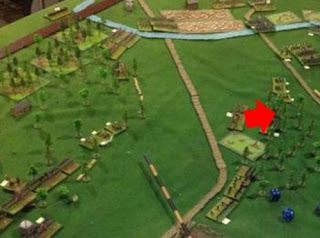 The picture shows the Rebel left denuded of troops and the building objective ripe for the picking. 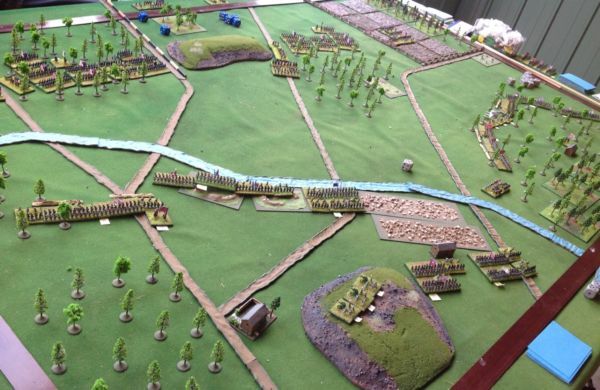 In the centre and on the right the Union positions are less secure...NO MATTER the Rebs were licked! A very enjoyable game! 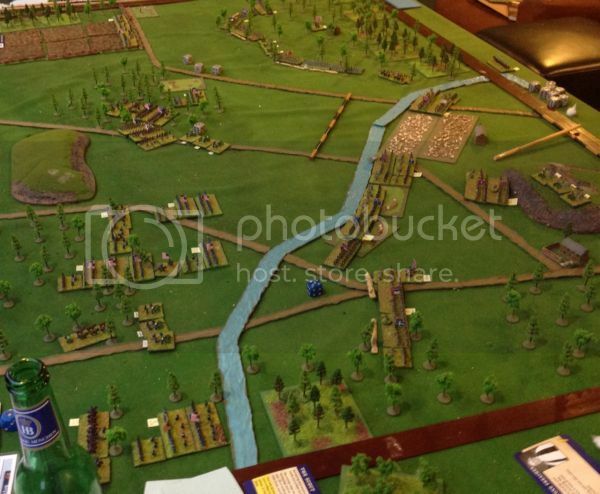 It ran smoothly as everyone has a few games of Longstreet under their belts now. There was only one slip up of rules and that was on the last turn calculating a single melee result but that luckily would have had no effect on the overall game. The Federal tactic of concentrating on one Rebel player caught us Southerners off balance and I was slow to react thinking the river line would be stronger than it turned out to be! I launched two charges (one aborted by the confusion card) both of which slowed my redeployment! The game ran 12 turns. It was so close it appeared whoever got the initiative on turn 12 would win and that turned out to be the case, both sides were fully engaged and both were nine bases short of the 'break point' losing at least half a dozen bases was a sure thing so odds were very short of a result in the first player turn! No one was critically short of cards at he games end so that was good. There's interest in the group to try a full nine game campaign! I'm not sure if my current 6mm ACW armies are big enough to field two 1865 Union forces I may have to place an order with Baccus! Also I may look at completing those couple of outstanding sceanrios I have sitting on the to do list and also try the Olustee one with four players as it was dessigned!